At Tally Impact Printers you'll find Tally line printer models and specifications. Compare Tally dot matrix printer models available here. 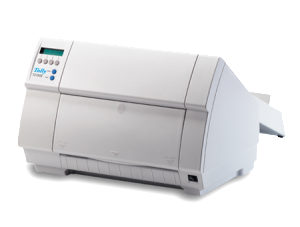 The Tally T2150 dot matrix printer is a highly featured, reliable and stylish machine. Performance and workload, ergonomics, maintainability, excellent price – everything has been incorporated to ensure that it is the only acceptable choice for the customer. Continuous and cut forms are fed at the front for quick and easy loading. This ensures a straight path for the forms resulting in reliable paper transportation, even on 6-part stock. The operator does not have to fumble over or around the printer to gain access to rear located tractors. If ‘tear at top of form’ is inadequate for your application, the T2150S features a cutting device which separates forms automatically. User intervention is kept to a minimum with a suite of features designed to ensure the products run at optimum reliability and performance. The product is at home in the computer room, data processing room, or in the office. An unobtrusive 52dBA acoustic rating results in a printer, which is half as quiet, compared with many competitive models. Looking for New Impact Printers? If you're ready to get new impact printers but don't have the time to spend comparing printer specifications, talk to one of our experts. Call 1-866-430-6202. Our experts all have at least 10 years experience. Let us know the software you're using and what results you need, and we'll make sure you get the best printers for your organization. Call our experts at 1-866-430-6202 for information about quantity discounts.